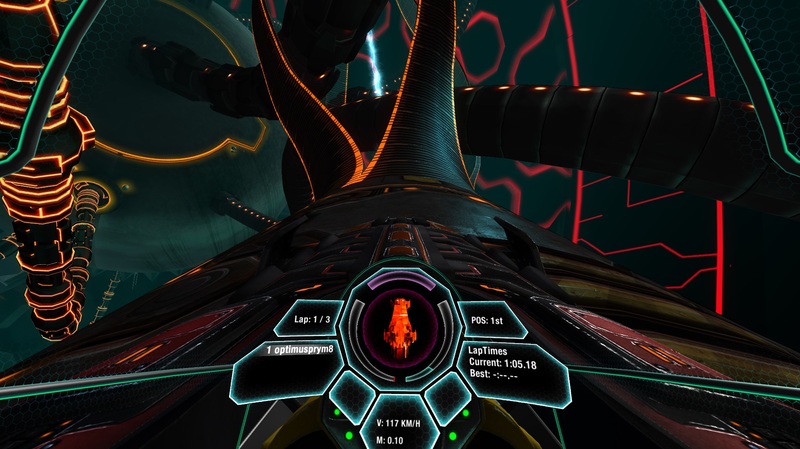 One of a new breed of made-for-VR games to emerge, Radial-G fuses elements from classics like Wipeout and F-Zero to deliver a high-speed, futuristic racing experience currently unmatched on the VR platform. 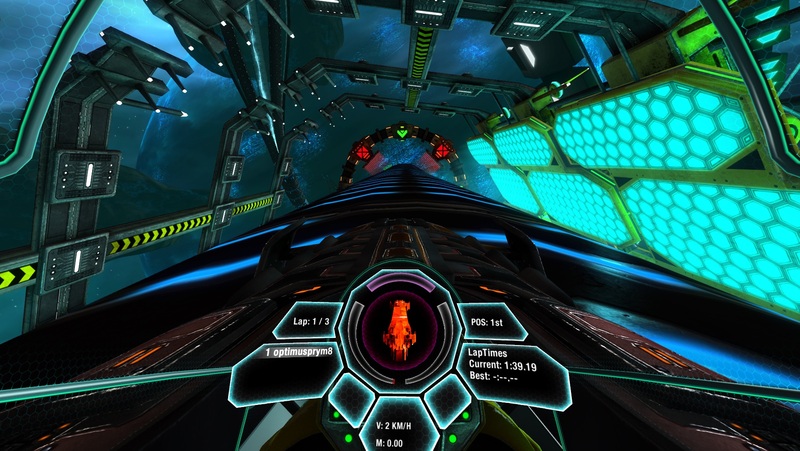 The game has you testing your mettle against a group of rivals as you hurtle around a tortuous ‘pipe’ track with jumps, boosts, and forking raceways. 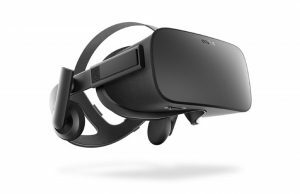 The title’s DK2 support is top notch and demonstrates VR’s ability to enhance the experience, allowing players to gaze into the distance and to track the apexes of corners intuitively. It also provides sumptuous, futuristic environments to distract the player as well as to sell the experience brilliantly. 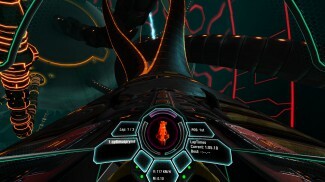 As a cockpit based game, Radial-G offers a surprisingly comfortable experience as you twist, turn and rotate around the track—one that you’d expect to produce instant nausea. 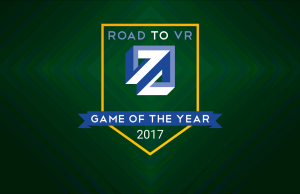 The title successfully found its way onto the Steam platform recently as part of a successful Greenlight campaign. Furthermore, Tammeka have proved their commitment to the title with regular updates and enhancements since release. 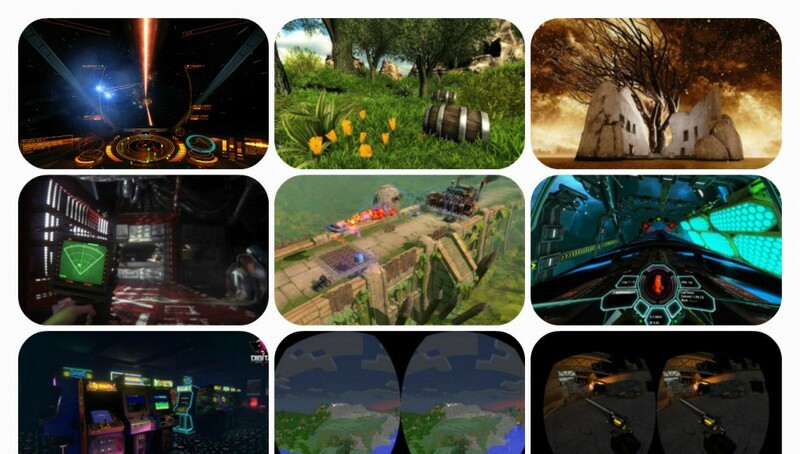 As such, Radial-G remains one to watch in 2015 as one of the poster boys in made-for-VR content. 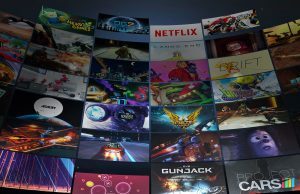 One of the more unusual releases this year, NewRetroArcade offers the opportunity to virtually stroll down memory lane. 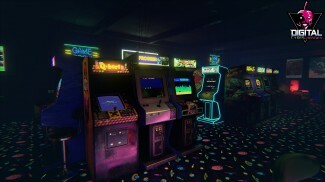 With retrogaming culture thriving and generations of older gamers pining for a little nostalgia, NewRetroArcade transports the player back in time to a virtual arcade, complete with hideous carpets and authentic replicas of old arcade cabinets. The twist? You can walk up to the cabinets and start playing! 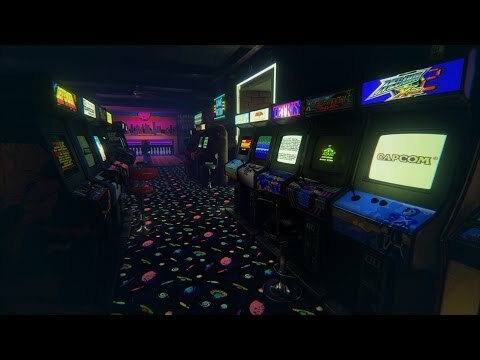 Digital Cybercherries, the developers of NewRetroArcade, clearly have a burning passion for the bygone era of the arcade. Each game cabinet is lovingly and authentically rendered with original artwork and joystick and button layouts. 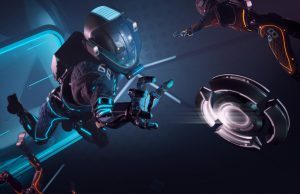 Whilst playing a title, currently limited to just a handful, you can glance down at the controls to see your actions mimicked in the virtual world. Furthermore, incidental details in the emulated games such as scanlines and moire patterns on the screens sells that retro experience brilliantly. Elsewhere, the arcade itself is rendered in all its horrific 80s authenticity, with neon lighting punctuating the darkened room. As a child of the ’80’s, I could almost smell the scent of stale cigarettes and adolescence which often permeated such venues in my youth. 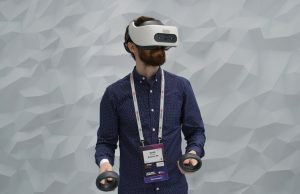 NewRetroArcade represents another facet of VR, an ability to repackage old experiences and present them in a realistic setting, a sort of digital time machine through which you can access and relive fond memories. The title is under constant development with improvements and new emulated titles being added regularly. This’ll be one I suspect we’ll revisit many times in 2015. 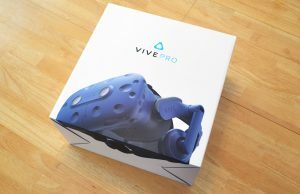 An unlikely early addition to our list of must-have VR titles back in the early days of the DK1, the VR-enabled version of Minecraft is startlingly compelling and earns a place in this list thanks to the addition of DK2 support this year. Minecraft is a title that needs no introduction, so I won’t. What I will say however it that it’s very difficult to describe the paradigm shift in experience Minecrift offers over its standard counterpart. 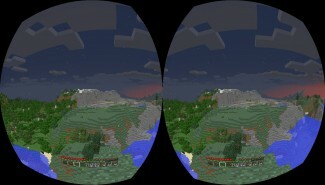 Stumbling into the vast, blocky vistas Minecraft is now famous for wouldn’t immediately strike you as an awesome virtual reality showcase, but thanks to the sheer scale on offer it doesn’t disappoint. 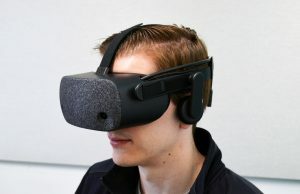 Add to this the ability to create your own towering structures to gaze upon whilst at the same time sharing the whole experience with online friends, and it’s clear why Minecrift is one title that people just ‘get’ when they experience it. 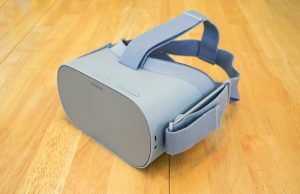 As an added bonus, given the near ubiquitous nature of Minecraft and its vast legions of fans, Minecrift is an important ambassador for reaching and inducting traditional gamers to virtual reality. It’s hard to go back to playing Minecraft on a standard monitor after experiencing in the Oculus Rift. 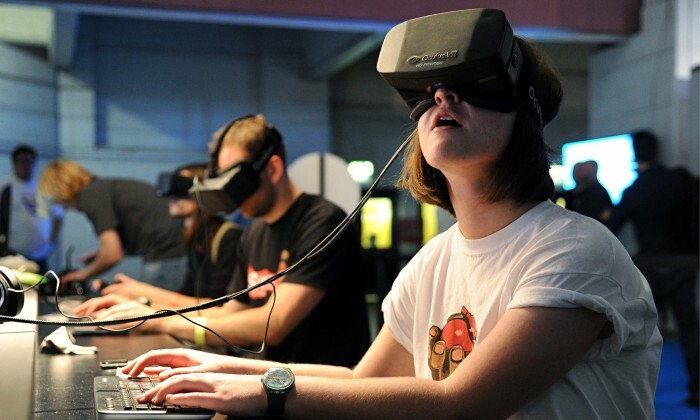 Grafting virtual reality onto classic games may at first sight seem like a great way to increase virtual reality’s catalogue of titles, but in reality is fraught with difficulties. 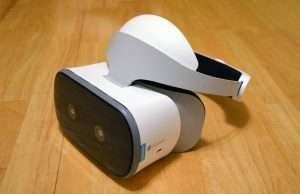 Although native support for Oculus Rift headsets has been present in Half-life 2 (2004) since 2013, many find the experience sub-par when compared against dedicated, made-for-VR titles. 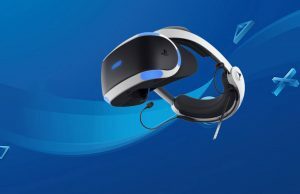 So, how do you get the best of both worlds—the immersive experience of VR and the classic gameplay of one of the world’s most adored games? 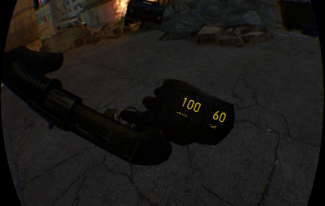 You download the HL2VR mod and rejoice! 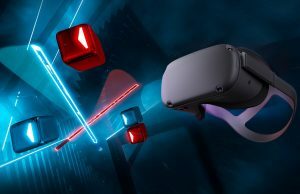 The mod, written and tested by Nathan Matthews and ‘Wormslayer’, integrates 1:1 motion input controls with Razer Hydra support, giving you the ability to hold and rotate your virtual weaponry mapped to your motions with the Hydra controllers. This means the gun no longer feels like it’s stuck to the underside of your chin, and can be wielded and aimed realistically. Furthermore, crucial HUD elements have been placed in 3D space on the weapon itself, meaning you can check your ammo reserves at a glance. 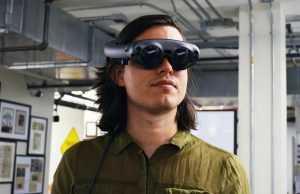 Flip over your virtual hand and you can check your health. It all adds hugely to the sense of immersion and, more importantly, makes this classic shooter much more playable in VR. 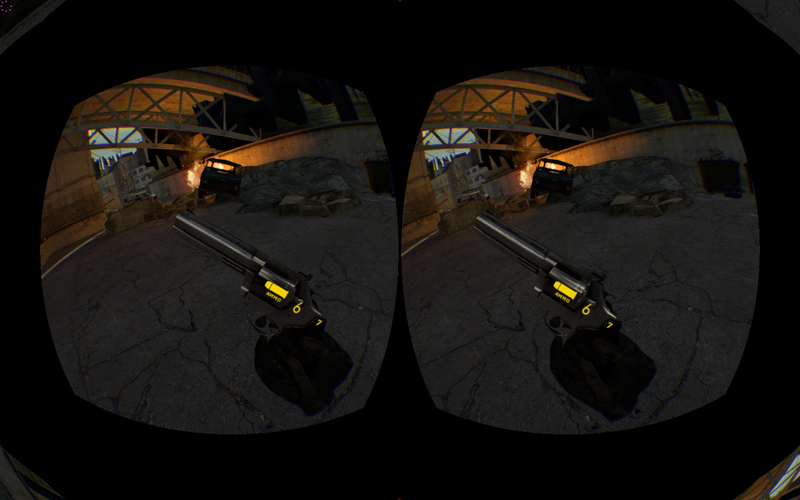 For these reasons, HL2VR breezes its way onto our list. 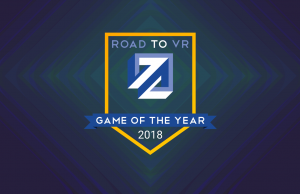 Our final choice is slightly left-field, but anyone who’s been hopelessly addicted to this great little VR title will probably agree with its inclusion on this list. 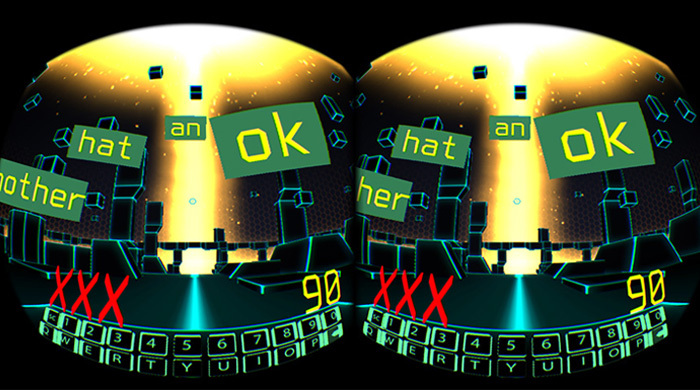 VR Typing Trainer is a game which occupied the a slightly obscure genre of games made popular by the likes of Typing of the Dead (2003). It’s a game where, in order to survive an onslaught of ever lengthening words, you must type those words (with perfect accuracy) as fast as you possibly can. The words in question appear in the distance and head relentlessly towards you, with words increasing in number and complexity the further you go. It’s kind of a weird, keyboard based shoot ’em up, I guess most analogous to the classic Space Invaders (1978). The neat part is that it isn’t only fun and satisfying to blast out a long word with a quick series of key strikes, but its actually a great way to practice typing. 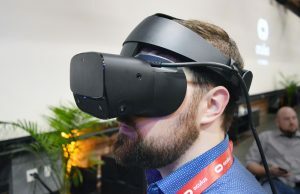 The trick is, this being VR, your face is obviously completely covered by the Oculus Rift, so you’ll need to sharpen your touch typing skills if you have any hope of achieving the highest score—hence VR Typing Trainer. All of this takes place in a neon, retro-styled environment, simplistic in style (think retro-Tron) it keeps your focus on the task at hand, blasting those evil words with the power of your fingers! That’s a small selection of the incredible titles that crossed our path in 2014, there are many more worthy of mention of course but this is all we had space for. 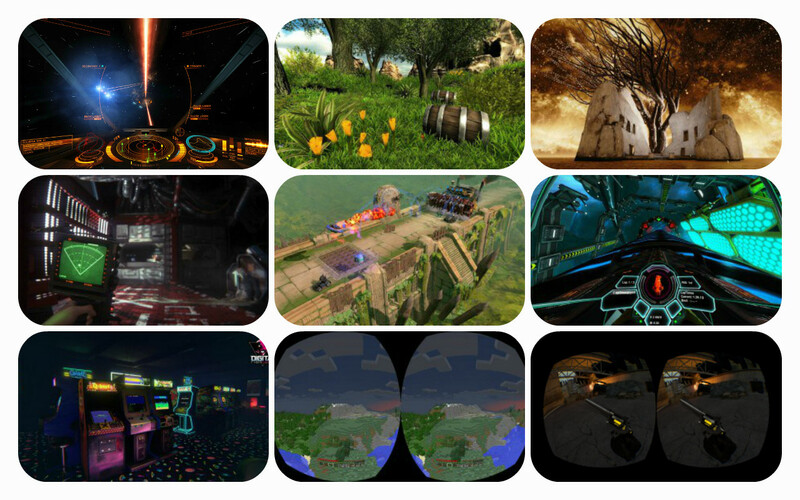 If you’d like to share your personal favourites of 2014, let us know in the comments below. 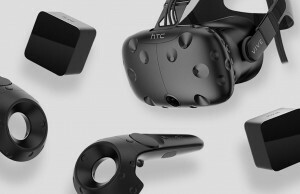 In the mean time, with an incredible 2014 filled with dazzling new VR experiences behind us, we can’t wait to find out what’s in store in 2015. Join us in just a few days when our coverage of CES 2015 begins, as we report direct from Las Vegas.